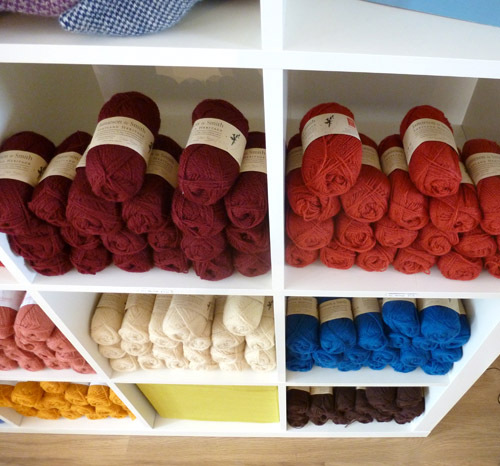 A new wool shop has opened up in Bristol! It’s only a few blocks away from me too, so obviously I went in for a nosy at the earliest possible opportunity. This is Beshley’s Wool Shop: A shop that aims to stock nothing but yarn from the British Isles. Now that’s a mission statement I can get behind! So what do we have inside? Erika Knight, Excelana and Jamieson & Smith’s Shetland Heritage? Awesome! This place is going be saving me a whole lot of postage in the future, I can tell! Not pictured here: Woolyknits, Artesano yarns, Kate Davies’ patterns sprinkled throughout the shop, loads of Blacker yarn, me trying to stay calm. The pure Blue-Faced Leicester yarn below feels incredible. I believe those knitted owls are also up for sale along with the cute little pin cushions at the bottom. There’s also this neat selection of vintage needles, patterns, notions and buttons. Bonus sheep artwork! And Beshley herself! She told me a little of her plans for the shop – more of all the current brands (including all the colours of the Jamieson & Smith rainbow), Susan Crawford patterns (A Stitch in Time anyone?) and just packing as much British yarn into the shop as possible. It’s pretty cool to see a brand new business start up on your doorstep. With all those local products, found objects and cool graphics everywhere, Beshley’s Wool Shop fits right into Bristol already. I’m looking forward to seeing what new things come into the shop…and subsequently buying those things! How lovely! This shop looks like such a great, cozy place. A shame I live on the wrong side of the Atlantic…maybe someday I’ll manage a visit. Q – Oh, I’d love to visit this shop.